Need a bit more than just a SparkFun Stepoko controller? 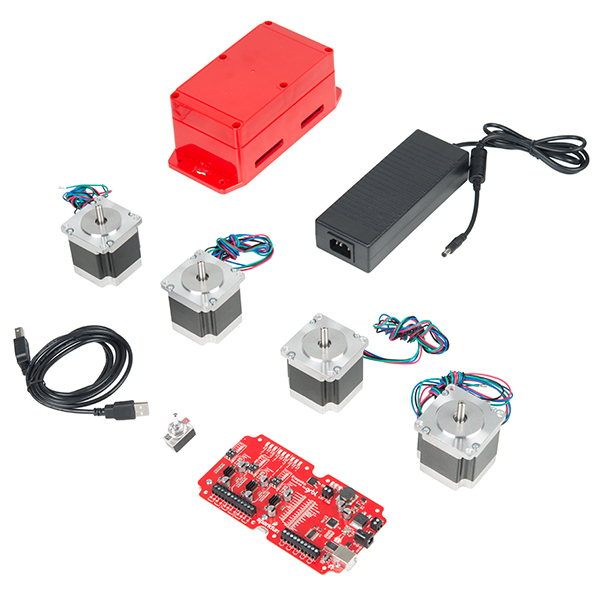 The Stepoko Motion Control Add-On Kit provides you with everything you need to get your CNC moving, powered, and controlled. This add-on will allow you to convert a simple mechanical kit into a full CNC machine! Inside each kit you will find our SparkFun Stepoko board, four NEMA23 stepper motors, an enclosure milled to hold the Stepoko, a 24V/5A power supply, a toggle switch, and 6ft A-B USB cable. Just add your own rig (like the Shapeoko 3) and you are ready to get started. The included SparkFun Stepoko is an Arduino compatible, 3-axis control solution with pre-installed grbl software and is able to connect to your computer to accept stepper motor commands. Additionally, the four stepper motors found in this kit are ideal for CNC projects by offering 125 oz.in of torque, 200 steps/rev, and adhere to a NEMA23 form factor. Note: This kit does NOT come with a power cable to connect the power supply to your specific wall outlet. This way you will be able to use your own cable that fits your country's national standard. I'm guessing that the bottom gantry section with two motors is driven in parallel by one driver axis? Those are 2A motors, so they'll only get a bit less than half that current each. You are correct! But there's two of them so they provide twice the torque and it's a wash. The purpose is to apply smooth motion along two separate rails.